Last week my parents, my brother, and I drove four hours north to Waupaca, Wisconsin. We have spent a week in Waupaca every summer of my life. Waupaca is a tiny town situated about an hour and a half North of Madison by car. 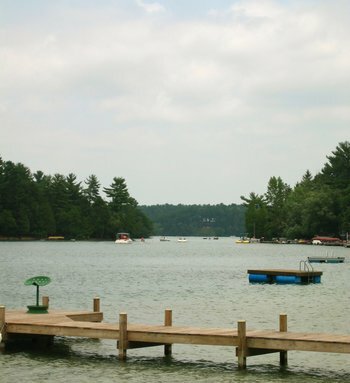 While Wisconsin is home to many lakes, Waupaca itself boasts 22 inter-connected lakes. Thus, it is known as the Waupaca Chain O' Lakes. We have been staying on McCrossen for years, renting a tiny three room boathouse for the four or more of us. Things get cramped, but it encourages us to stay outdoors where we should be. The Menomini Native American tribe was among the first to inhabit the area. During this time "McCrossen Lake was thought to be a lurking place of the great fish monster, Ma-shenomak, who was believed to have destroyed the “first people” " according to the Chain O' Lakes Protective Association. One of the greatest features of the Chain is the ability to boat to restaurants and bars. When using this mode of transportation our favorite destination is Clearwater Harbor. 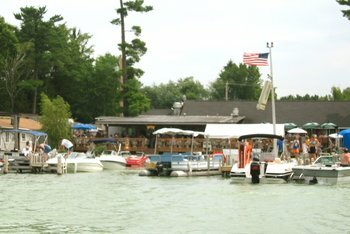 Boaters may dock and choose to be served right in the boat or find seating on the ample outdoor deck. There is an often raucous crowd of half naked-sunburnt-and not so fit-patrons and either a band playing on the floating stage or a volleyball game being played in the shallow water. While known for their burgers (the Blues Burger is a family favorite), I keep coming back for the fried cheese curds. 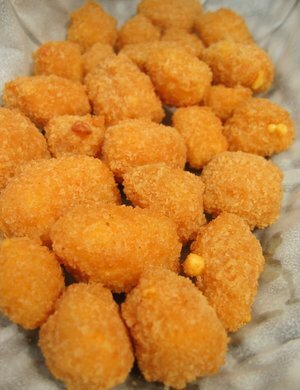 These warm and breaded bite-sized beauties of Wisconsin Cheddar cheese curds are like nothing else I have tasted in the world. Sure, every restaurant in Wisconsin has their own version of breaded cheese curds, but none that I have tried even begin to compare to Clearwater Harbor's. The texture is perfect, they are light, airy, and crisp, and they are seasoned with a perplexing and divine combination of savory flavors. A basket of cheese curds, a pint of New Glarus Spotted Cow, the Clearwater bar crowd, and the blazing sun make up a meal that I crave from vacation to vacation and enjoy in large quantities when we finally make it back for a week. One other favorite place is the tiny village of Rural. With just a fifteen minute bike ride from our boathouse one can reach what is simply a gorgeous and unspoiled town. It has a few obligatory antique stores but it also boasts some incredible historic landmarks such as the old Red Mill and many spectacular old homes. The Crystal River winds through the village and is a popular resting point for tourists who partake in the Crystal River canoe trips. The Weller Rural Store is by far my favorite place in Rural. It is run by an sweet older couple and it basically seems to be an excuse to talk with a variety of people during the day. They sell a few grocery items such as Wonderbread and peanut butter and you can rent an inner-tube to use on the river for a dollar. 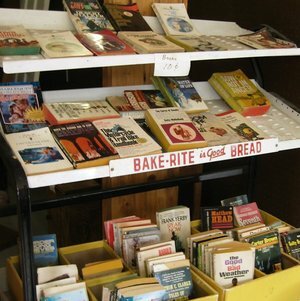 They also sell some garage sale style items such as ten cent books and household items. When we visit the Weller Rural Store, we go for the ice cream and the Ting. They sell ice cream cones of the standard chocolate, vanilla, or strawberry variety for 25 cents and for 50 cents you can purchase a fancier flavor such as maple pecan or pistachio. 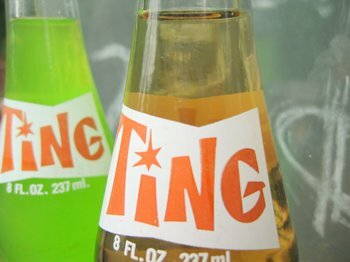 Ting pop (not associated with the Jamaican grapefruit drink of the same name) is manufactured and bottled in a nearby town. Each bottle still costs 25 cents, though it is imperative that you return the bottle because they are no longer being made. The way I have heard it, it appears an older man runs a bottling company that likely bottles popular beverage brands for local distribution. However he used to also bottle this local Ting beverage and it appears he will continue to until the bottles run out (which they are reportedly quite close to doing). The pop bottles are heavy glass and they are capped with a random assortment of bottle caps that are often unassociated with the beverage in hand. The pop itself is sugary and comes in flavors such as lime, cream soda, grape, and 'blue'. I do not ordinarily drink pop, but I love Ting when I able to drink it once a year from the Weller Rural Store. Waupaca is one of those places that a new-comer might not see correctly at first. I can imagine being taken to another family's 'Wisconsin lake destination' and wondering what the big deal is. Due to such a life-long attachment to Waupaca and through seeing it change year by year yet still keep much of its character, I love it like a local and it holds a special place in my heart. I took so many more pictures and it pains me to have lost them forever. But, I will be back to Waupaca next summer and I will be sure to report on some of the places I intended to this year. I didn't think anyone else knew about ting. and that picture of the cheese curds made me hungry... I know what I'm doing first thing when I get back to wisconsin...spotted cow and fried cheese. delicious. Hi Gemma, what a wonderful description of Waupaca. I've never been there but you certainly make it sound very charming. Inner tube rentals and the Ting Pop! And I'm so happy that you posted a picture of those cheese curds, I was hoping you would. I will be daydreaming about them for a while. It sounds like you had a great time, I'm sure it was hard to leave! Wow Lizzy, I had no idea anyone else had heard of Ting either. I am impressed. Mmmm. fried cheese curbs and spotted cow. I wish I could eat some with you, but it sounds like I will be gone when you are here. . sniff. Thanks Michele, I'm glad you liked the cheese curd picture. I remembered your request and was sure to document them for you! I don't think so... but it's really that book..
My Family goes to waupaca too. Here's another story about waupaca from my dad. I found your post while searching for Ting. Having grown up in Waupaca, I have very fond memories of Ting and thought it was long gone. I used to love the orange. While the Harbor's cheese curds are ok, there are many other places in WI with curds that put the Harbor's to shame. My favorite is the "battered" variety. I used to like the Harbor's, but I don't even eat them now that I've tried these. Often they are fresh and hand battered. The version the Harbor sells are frozen and can be purchased in nearly any store, food club, or your local "Schwans" distributor. I want a Ting shirt! Where can I get one?! I wish I knew Tammy! I want one too. Just got back from Waupaca. after 27 years of almost yearly waupaca vacations, my daughter, now 25, had to announce that her "childhood is officially over" when told that ting is no longer being made. sad. sad. sad. and to think of how i recycled the cases of ting that we'd bring home to downers grove, il., but then forget to return it to waupaca. now, i feel responsible for the end of ting. we did visit clear water harbour, the red mill and our favorite restaurant The Pine Tree Supper Club that is closer to New London. Also, scooper's ice cream and the Tom Thumb miniature golf continues! I spent every summer of my childhood in Waupaca as well, making the 2 day drive from New York with my parents and brother and sisters. 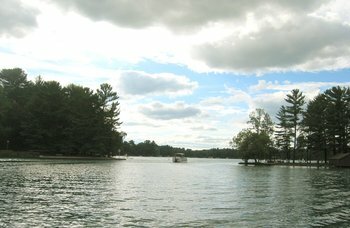 We would stay a couple weeks on Round Lake with my grandparents, who lived there year-round. Katie, I read your Dad's story and loved it (I started going to Waupaca in the '60s). Sadly, my grandfather passed away 4 years ago, the house was sold, and we have not been back since. I remember cheese curds and Ting - the green Ting was the best! We used to walk to Lorimer's Trading Post every night after dinner and buy frozen Milky Ways and eat them in the little park across the street. Later, we would sit in that park and wish we were old enough to get in to the Casino! I am hoping to get back to Waupaca soon, but in the meantime, I am looking for Waupaca or Chain-O-Lakes sweatshirts or T-shirts. Does anyone know if there is any place to get them online? 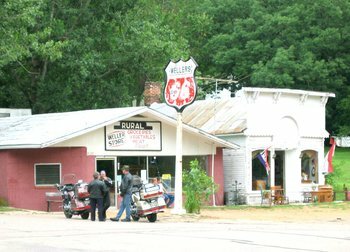 I was just up in Waupaca and can confirm that Ting was no where to be found - Even at our old stand by Weller's. The end of an era indeed. I'm so glad I wrote about Ting. The memories you have all shared with me about Waupaca have been a joy to read. Thank you! This is awesome. I am the granddaughter of Sarah Lorimer who ran the Trading post. I so miss every weekend, summer, trip up to the Chain. I will have a special connection to this place for the rest of my life. Great time of year to be out on the Chain!